This month's theme for the Old School Kidlit Reading Challenge is Books You Loved in Childhood. I have re-read many of my childhood favorites in recent years, but there are some I enjoyed and never revisited. As I choose my reading material for this month, I'm trying to focus on books I remember enjoying, but about which the details are otherwise fuzzy in my memory. Bunnicula is precisely this type of book. The Monroe family pets, Harold (dog) and Chester (cat) are startled when, one night, Mom, Dad, Toby, and Pete arrive home from the movies with a rabbit. Because the rabbit was found during a screening of Dracula, the Monroes decide to name him Bunnicula. 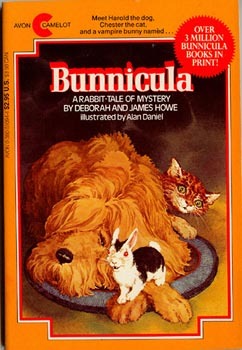 This name, along with the rabbit's unusual coloring - white, with a black spot resembling a cape - and the fact that vegetables keep turning up in the fridge will all the juice sucked out of them, causes Chester to conclude that Bunnicula is a vampire. Chester has read a lot about vampires, and he immediately tries to get involve Harold in a plot to prove Bunnicula's identity and get him out of their house. Harold, though very fond of Chester, is more skeptical of the situation and even begins to take a liking to Bunnicula. I truly don't remember much about reading this as a kid, other than the mysterious mood of the story and its tongue-in-cheek tone. I was surprised, reading it now, by how excellent the writing is. Based on the premise, this sounds like a frivolous fantasy novel, but it's actually quite well-crafted, and it respects the intelligence of the child reader. The vocabulary is rich, and there are a number of impressive literary allusions to authors such as Edgar Allan Poe and Charles Dickens which give the book an air of sophistication. The animal characters, though human in their sensibilities, are limited by their capabilities, and the combination of their intelligence with their animal instincts is very fun and very funny. Though it is obvious as the book goes on that there is definitely something unusual about Bunnicula, the story gives the reader plenty of reasons for doubt, and this provides a strong feeling of suspense and uncertainty that make the reader want to read just one more chapter. It's a compact, well-structured story that I would argue is much better-written than many of the 300-page tomes being published today. I loved these books so much!